VRLA stands for Valve Regulated Lead Acid. This means that batteries are sealed and that gas will escape through safety valves when overcharging or cell failure. AGM sstands for Absorbent Glass Mat. In this battery the electrolyte is absorbed into a glass-fibre mat between the plates by capillary action. AGMs are suited for delivering short, high-current charges, eg engine starting. 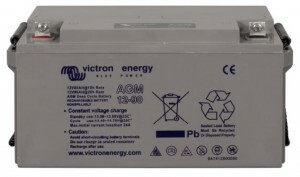 VRLA batteries have exceptional discharge recovery, even after deep or prolonged discharge. see the charts below for more information and specifications.